A codex was an early form of what we now know as a book. 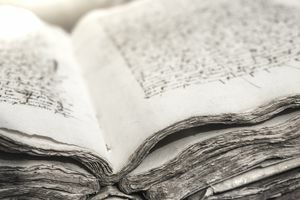 A codex is distinguished by handwritten, sequential pages bound together and enclosed between a case (that is, cover) to form a single, portable unit of reading material. These early books replaced scrolls but pre-date the invention of the mechanical printing press. The term "codex" is often used to refer to any ancient, hand-written text. According to Nicole Howard, author of The Book: The Life Story of a Technology, The Roman diptych was the precursor to the codex and may have been the inspiration for the development of its form. A diptych was a double tablet made from two blocks of wood hinged together with string and waxed to create writing service - though it had no pages, it opens in the same way a codex (or today's book) would. The term codex is derived from a Latin term that means "block of wood," and was so named because of the resemblance and, perhaps, because the wood was used for what we would now refer to as the casing or cover of the book. (Note that the term "book block" is still used; it refers to the bound, printed pages of a book before the case is attached. The plural of "codex" is "codices." There are instances folded and gathered sheets of papyrus (which were made from leafy aquatic plants), but the bulk of codices were created from parchment (sheets made from cured, stretched calf skins, also referred to as vellum). These began to appear in the first century CE. A codex offered numerous advantages for sharing writing over the scroll, the then-prevailing form of portable reading and message device. Parchment-making was labor intensive and, unlike scrolls, codices allowed writing on both sides of the sheet, saving parchment or vellum. Ease of Use - turning pages is more efficient than unrolling a long, long scroll. Plus, it's easier to find a passage by flipping through pages rather than unrolling a long, long sheet and having to look through the entire text all at once. Portability - codices were more compact than scroll. Durability - with no need to unroll and re-roll, codices were less fragile than scrolls. According to Howard, despite the advantages, codices were slow to catch on and "not until the fifth century did codices become truly commonplace, and even then such notable figures as Saints Augustine and Jerome were [still] using scrolls in their private correspondence." Fast forward to today: Books have come a long way since then with the invention of ebooks and e-readers.